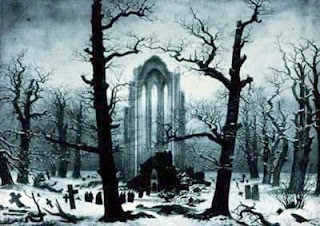 I’ve always really liked Caspar David Friedrich’s painting, “Cloister Graveyard in the Snow”. In it, we see a crumbled cathedral with only a bit of the porch and chapel remaining amid twisted, dark trees. But if you look closely, in the middle ground, you’ll see a trail of monks still marching into the ruins, presumably to continue their monkish duties. The painting has both a positive and a negative message about religiosity. On the one hand, it suggests faith can persist even when, socially speaking, religiosity is generally perceived be in ruins; but on the other hand, it also reminds us that ritual can persist even when the life of a church is gone. I guess the message you take depends on the perspective with which you view it. Alas, viewing the original is one thing you cannot do. The painting is no more. It was destroyed in the firebombing of Germany, apparently. However, its twin messages are surely still with us. The message that religion can go on long after spiritual death is hardly a new one. It’s at least as old as the Bible. Remember what the Lord said to the church at Sardis: “You have a name that you are alive, but you are dead”. There it is. Of course, nowadays the favoured imagery for this phenomenon has become a bit more colourful. Scott Gunn, for example, sure knows how to run with a metaphor. He’s got a rather disturbing promotional video called “Zombie Church” — complete with “real” zombies. View at your peril. Gunn’s an Episcopalian, but he also thinks his metaphor works for a lot of other denominational groups. According to him, churches today are slipping into “zombie” mode, meaning they retain the appearance of having some life, but inside have gone dead a long while ago. The causes? Not enough money to missions, not enough ‘gospel’, deferred maintenance, aging congregations, lack of new ‘church plants’, dwindling numbers …” All pretty predictable. But wait a minute. Tyler Edwards has a book by the same title. And Ray Stedman has a message entitled “Church of the Zombies”. And hey, even the Catholics are in on the action. That Will Never Be Us! Suddenly it seems like everybody loves that metaphor. It’s understandable, right? What could be a better picture of what happens when people continue to behave religiously, but the life has gone out of everything they’re doing? But it’s interesting that the metaphor has taken hold so generally. Of course, we’re evangelicals, so we don’t have a problem imperiously imagining that top-heavy clerical organizations would end up like the walking dead, do we? As for us, aren’t we the ones who practice the life of the Spirit throughout the congregation? So there’s no such danger for us, no matter how many of the conventional denominations fall prey to it. Except that we have. Oh, we may have taken a bit longer than some of the larger and more formal denominations, but we live in exactly the same society that has deadened whatever life those groups had in them in the first place. We face those same pressures. Not only that, but in the name of fighting off creeping death ourselves, we’ve moved — over the last three and a half decades especially — in the direction taken by all those larger denominational groups before us. And we are now paying a similar price for employing their methods. But I’m not going to criticize the mainline churches or the various other denominational entities. They stand or fall to God, not me; and since I’m not a member of any them, there’s little value in my carping about them. But I am going to risk putting a little evangelical laundry in the wind, so to speak. Why would I say that? How could I speak ill of congregational evangelicalism? Well, I really don’t want to. But on the other hand, there sometimes comes a time when honesty takes precedence over politeness. And that time is when situations are rapidly becoming critical, but some opportunity for a change still exists. And I don’t actually think I’m alone in thinking that sort of thing, even if I’m in slim company in being willing to say it. If we’re honest, it’s pretty generally admitted by all and sundry that our local churches are today rather far removed from our real lives and that most of us see less and less connection between them. And this is a real paradox. We need to ask ourselves, how did we, who are supposed to be indwelt by the living and active Spirit of God, end up feeling like zombies? Something’s gone really wrong. But so long as we give in to the apprehension that maybe speaking about it is somehow disloyal, there’s zero chance we’re ever going to change it. I guess whether we’re willing to speak up depends on this: just how dead does your church life feel? If it’s not really, really bad, maybe we won’t say anything, and just hope things change. But if it’s becoming completely painful, discouraging or debilitating, then maybe, just maybe, we’ll begin to suspect that a little plain speaking — public discussion even — is exactly what we should do if we actually care about the survival of the church. Okay, those of you who are happy with current evangelical church can stop reading here. So too can those whose loyalties to the very word “church” are so poignant that you cannot speak honestly without feeling disloyal. I have no desire to offend any person’s conscience. But for those who actually find some sympathy with what I’m saying, I’m going to try to map the territory of church congregational life through its larger patterns of change, beginning about the middle of the last century, but especially accelerating in the 1980s and 1990s in the Western situation. To start, let’s go back to the beginning. Among conservative evangelicals, two models of church life have a history: one I shall call the “congregational model” and the other is the “clerical model”. The difference between them is this. Under the congregational model, the local church thrives based on the commitment and giftedness of its members alone. No single person holds supremacy. Every congregant is believed to be uniquely gifted by God, and this gift is considered indispensible for local body life. Leadership is achieve through a council of the spiritually mature (called “elders”), with the assistance of an executive of servant-leaders (“deacons”); but movement into leadership is (or ought to be) fluid, and the enthusiastic participation of every congregant is the basis on which everything gets done. It is the wave on which the vitality of the congregation rises or falls. Contrast this to the clerical model. In this second model, a lone, salaried man (or occasionally a woman) is placed at the top of the congregation. He may keep a stable of elders, but essentially they are the executive for his vision. Usually, the pastor sits on — even at the head of — the board of elders, and his willingness to initiate determines their ability to support. Below this arrangement is the lower congregation. Though in theory they are believed to be gifted, their individual gifts are no longer considered essential to congregational life — at least, nowhere near to the extent that the vitality of the top executive level is thought to be important. The general belief today, even among formerly congregational-model churches, is that the congregational model cannot any longer be expected to succeed, and the clerical model is the inevitable fallback. This is not entirely true: actually, in the developing world, the congregational model of church life is astonishingly vigorous. However, in the (post-) modern West, we see many congregational churches faltering, failing and even closing altogether. Whatever the cause, it is undeniable that the congregational model is currently failing. But now we are starting to see that the clerical fallback model is not going to secure a future for the Western church either. Its pathologies are less immediate, and it can run down slower; but run down it does, and in some pretty predictable ways. As Thomas Hardy famously wrote, “If way to the better there be, it exacts a full look at the worst”. That’s often true. To know what needs to be done, we need to take a hard, honest look at where things are really at. And if we don’t, there’s little chance that we will be able to make the kinds of changes that can actually reverse our situation. So in that spirit, let’s trace the decline of the congregational model of church life through its collapse into clericalism and beyond, to the final situation as it is now appearing in post-congregational churches. Stage 1 in the death throes of the congregational church is the withdrawal of the congregation from congregational life. Stage 2 is a swelling cry that something must be done, and that “something” usually amounts to the hiring of a professional person for the doing of the things the congregation no longer is willing or able to do. But even in situations wherein a local church has found a particularly “good” candidate, and even if they’re sure they can run with this one man for several years, what’s happened is the transfer of the structure of the church into an organizational format that gives singular power to the next man, who is unlikely to be as “safe” or “good” as the last one may have been. When the next man applies, it will not be to a congregational church in transit, but to a clerical church, one with a much more exploitable power structure, more accessibility to church funds, and a more attractive level of prestige for someone who likes the limelight. This has happened again and again. In its transitional stage, the local church found a seemingly ideal person to serve as “pastor” or “teaching elder” in an unassuming way. But he doesn’t last forever, and his replacement is quite a different animal. Naturally, Stage 4 is the fully clerical church, with professional religious leaders and with a congregation that responds to these hired specialists rather than generating its own leaders. At Stage 4, the professionals are addressed by a title, usually “pastor” plus their first names, with a sort of paradoxical combination of reverence and familiarity. An atmosphere of artificial affection is generated. Often it needs to be sustained by fawning deference at the pulpit or the board table, and the paid staff cultivates it by various gestures of exceptional piety or ceremony. There is “pastor-appreciation week”, and “we’ve-all-got-to-get-behind-this” rallies on the one hand; and there are “baby dedications”, “special Sundays” and “commission services” on the other. In almost every public situation or occasion for speaking, teaching or evangelism, the pastoral staff controls and dominates the agenda. Their public profile rises, and the value of the congregation falls. This is the position in which many formerly congregational churches stand today. They’ve professionalized the shepherding and teaching roles, usually with a single man at the head, now called “pastor”. And for a couple of decades now we’ve seen how this clerical pattern runs in formerly congregational situations. What we know is that while it doesn’t run particularly well and has many unsavoury side effects, it has this advantage: that it can maintain a congregational church on life support for some period of time, compensating somewhat for the decline of service-minded congregationalism. But as it turns out, this is only a temporary lease on life. What’s now being revealed is Stage 5, in which the salaried “pastor” or staff becomes increasingly the only source of spiritual energy and vision. The congregation settles into consumer mode. After all, they’ve paid for these jokers to do their work for them, and since they’re paying good money, why should they not expect a good product? Stage 6 is when a groundswell of discontentment begins at the congregational level: no one is quite happy that they’re getting good value for their money, and they don’t like the program that’s being arranged for them. Or there’s some political issue that they see as swept aside by the hired hand. Then they start to remember that they hired these people: how dare they not deliver value, or turn out to be so unresponsive to congregational concerns? Quietly, the rumblings of rebellion start, and then a concerted movement of impeachment begins. And either it builds to a successful climax, or the hired staff realizes just in time that the jig is up, and with a great show of moving up to some new challenge “the Lord has called them to” in some new church or field, they manage to get out with dignity more or less intact before they’re shown the door. Then a hiring committee is struck, and the post-congregational parts of the cycle begin again. In other cases, the “pastor” or paid staff digs in, fights off the rising tide of the discontent by banishing or disillusioning part of the congregation, asserts its primacy of control over the rest, and thereafter essentially designates the local church as “his” church — essentially the private personality cult of the main man. Generally he enjoys tenure after that, and the congregation rises and falls only with him. When this cycle is completed, what is left cannot be realistically called a congregational church at all. Gone is the doctrine of giftedness of the believers except in name. Even more gone is the doctrine of the priesthood of believers, for its nature is completely antithetical to clericalism, and this fact absolutely guarantees that the hireling leaders cannot endure its mention. For sometime afterward the private members of the congregation may continue to occupy minor roles of leadership: Sunday School superintendent, Life Group leader, youth leader, groundskeeper, bookkeeper, secretary and so on. But their enthusiasm will become increasingly difficult to sustain as the real exercise of their gifts is suppressed by need of the clergy above them to take credit for all that happens. Not only that, but the pastoral staff will continually download responsibility onto the volunteers until they begin to feel crushed. After all, being a hired clergyman is essentially a “make work” project. They are paid a lot of money, and they are expected to prove that they deserve it. One way they can reassure themselves that they are doing this is by generating new initiatives and programs, and keeping things humming. So pressure is always on the “pastor” to prove that he or she is delivering on the goods for which the congregation pays (and this to the satisfaction of the whole congregation) he or she is obliged continually to initiate programs and create activities involving the laity. Meanwhile, though, the congregation is plenty busy with the private affairs of modern life. Members may still find time for priority spiritual activities, but they certainly do not have such an excess of time that they can afford to fritter it away “playing church” through additional frivolities invented by the clergy. Did they not, in fact, hire someone for the express purpose of making their own life-loads more manageable? So they have no interest in the clergy’s need to prove themselves. One by one, as the congregants begin to age, to diminish their commitments, to withdraw or to move on, the gap between clerical ambitions and congregational commitment widens. After all, no one much wants to sign up for new obligations that are simply guaranteed to become onerous. 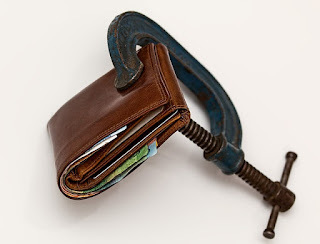 Soon the pastorate is complaining that giving is down, commitment is down, key roles in the plans of the leaders are going unfilled, and important programs are collapsing of their own weight. When this crabbing stage begin, the congregation really settles back on its haunches and withdraws. They become resentful of the guilt trips the clergy is trying to send them on, and they pay them back by stepping back even further. The organizational apparatus of the church — the schedule of meetings, the major programs, the Sunday message — continues to run, but the church itself becomes lifeless, unfriendly, cold and consumerist. A million tiny spats and in-fights break out, and soon people are drifting in and out of the congregation in a dispirited way. In this zombie mode, a church is very difficult to revive, primarily because no one any longer feels he or she is personally necessary to the life of the church. After all, the church is, at that point, essentially a bureaucracy that runs on its organizational structure. In such a structure all parts are replaceable, and the disappearance of one particular part is never really a problem so long as another part can be found to take over that organizational function. People don’t like to be mechanical “parts”. Especially completely replaceable parts. And it’s not what God designed them to be. So they shouldn’t like it. But the pastoral staff doesn’t get that: after all, were they not hired to lead? How dare everyone be so difficult as not to follow! So discouragement sets in on all sides. The church is a corpse, at that point. But it just won’t lie down. Since it has an organizational substructure in place, it just keeps going … and going … and going, long after anyone feels there’s any life in the local body. Yes. Revival is possible. At least, I think it is, though I have to admit I have not seen it yet. I think we can be different, and do church differently … or rather, we can BE church differently, if we really want to. But we need to start speaking the truth to each other: about where we are at in our personal spiritual lives, and what we are or are not doing to obey the Lord in private matters; about what troubles us about our local congregation, its meetings and procedures (without feeling disloyal, because we’re really trying to diagnose and remedy, not criticize); and more than anything, about how we’ve lost the ability to worship. We also need to be willing to change … real change, I mean; for tinkering with our old mistakes will not do the trick. All that has failed. We need to look at abandoning it for something better. We need fresh thinking, but not (as with the clerical movement) “fresh thinking” derived from stale denominational conventions that have never really worked; real fresh thinking, meaning being willing to entertain a whole new set of suppositions about what church is for, and about what meaningful church life looks like. The “fresh” part needs to come directly from scripture. For I believe that what A.W. Tozer said in reference to Christianity is also true of congregationalism: “It is not that it has been tried and found wanting, but rather that it has been found hard, and not tried.” We have not really done congregationalism according to the full biblical paradigm; and since that is so, the remedy lies not in abandoning it, but it obeying it much more fully. The main thing is this: we need to go back to God, and back to the drawing board in our vision of the local church. If we do less, I do believe we will have nothing but zombie churches anymore. The message to Sardis comes to us like this: “Wake up, and strengthen the things that remain … remember what you have received and heard, and keep it, and repent”. Absent from that list is any commandment to depart from scripture, model ourselves after clerical organizations or adopt modern values like number counts and demographic surveys. It says to us rather, be sincere, be honest, be real, be loving, be obedient, be biblical, and do what it takes to make that pattern work. I hope you don't mind if I, as an invited (by IC) outsider (but yet also insider Catholic) offer some of my personal perspective. First, you were addressing this in terms of a zombie church where people have become, or are turning into, automatons following dictates rather than their own spiritual impulses. I read the Catholic parallel you provided a link to where a zombie accusation was similarity made. However the difference being that it was an, in my mind, off the wall rant by the Latin mass traditional segment that broke off after Vatican councils 1 and 2 railing against what they call the modernists. They cannot be taken seriously in my opinion since, for one thing, they would insist that I attend a mass in which I hardly understand a single word (since I do not speak Latin) and do not have the current beauty of the prayers of the English mass. In addition there was nothing more than a lot of accusation and zero proof, fact or substance offered in that blog. This brings me to my key points that I suggest should be brought out more by you or anyone looking at (generic) Christian church life. A. The purpose for having a church and meeting there is primarily in the communal service (mass for Catholics) for the purpose of public worship of God with the attendant benefit of obtaining practice, training in, and habituation of such worship, which is appropriate and pleasing to God. This should be the spring board for encouraging and enhancing private prayer life. Note that the essential purpose here is also to obtain the graces bestowed by God on those who partake in this prayer life. This is essential for all who are new or have to renew (like most of us, or after having fallen away) their spiritual outlook, commitment and direction in life. Those especially who need immediate and urgent spiritual reconciliation as well as material care that God will provide (often through the congregation). B. Once point A is understood to be primary, then don't get bothered by the secondaries. All organizations require structure and leadership akin to corporations. And all organizations provide instruction on goals and methods benefitting the individual and organization. The beauty of the church structure is that the employee can fire the officer while in the secular world it's the other way around :-). Simply remember that it's fine to be doing (or not doing) all kinds of things as long as point A is known to be primary. So don't sweat the other stuff too much but use it as a tool to embrace the tepid, discouraged, lost or timid soul in bringing them closer or back to God. Thanks for the thoughts, Q. IC will probably have more to say when he gets back from his Christmas gallivanting. I agree with you that "All organizations require structure and leadership akin to corporations". However, I think IC's point is that the Church was not designed by God to be an organization at all. Rather, the Church is an organism. This "body" concept is no one-off metaphor, but is repeated throughout the New Testament (Romans 12:4-8; 1 Cor. 12:12-27; Eph. 1:22-23; 4:11-16; 5:29; Col. 1:18, etc.). I will not argue with you that it has become an organization: that is clearly the case. But it was never intended to be. That is not to say that the Church should not be organized (after all, every organism is "organized" or it would not function). But the Church's organization is the sort of natural order found in the human body, not the mechanical, artificial sort found in corporations. When the only thing keeping a local church going is the schedule and the paid staff, it no longer possesses the qualities of spiritual life, only the appearance. That is what we are concerned with. I have no doubt IC will express it better. P.S. If it's any consolation, I can't picture getting much out of Latin mass either. Yes, Tom's right: I was not per se thinking of the Catholic Church's experience above, but rather of the evangelical transition from a local body (organic) to a hierarchical organizational entity -- from a corporate entity to a corporation, if you will. The "Latin Mass" issue I have heard about; but I agree with you that even those of us who have some Latin would be unlikely to have enough to derive benefit from a Latin Mass. Au contraire, I suspect the only reason for advocating such a thing would be to confuse the congregation so much they began to think something profound was being added, simply because they didn't understand a word of it. I must say, though, that I sure wish a lot more Christians understood the purpose of the Church to be first and foremost worship. I'm glad you made that point so poignantly. I agree. At the same time, I would say (speaking here only of the evangelical experience, of course)that organization is not merely an option or add-on that can be dismissed. To paraphrase McLuhan, "The medium becomes the message." That is to say, when things get formalized and organized by such structures as paid clergy and pyramid management, it changes the whole message. It not only creates a clergy-laity division found nowhere in the Bible, but also emphasizes the passivity of the congregation. It makes a new "head of the church," one placed between the congregation and Christ. Whereas we know "there is [but] one God and one Mediator between God and man[-kind]," and no legitimate intermediary can be placed there. So the organization warps the message on many levels. We need to understand that better, I think.